When I was doing my research before bringing Betty home for the first time, I was lucky enough to know an experienced dog trainer. Melissa had cared for my cats in the past, but the focus of her All4Pets business now is to provide dog training. She will still happily arrange pet care for you too with her army of trusted employees. I didn’t know the first thing about what a dog’s needs were, so I purchased everything Melissa told me to. From experience, some of the items were invaluable, and some I could do without, just because I wasn’t too bothered about having a well-trained dog that did all sorts of tricks. 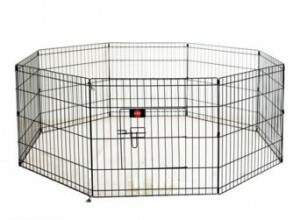 If you are getting your dog from someone who cares about where their animal’s next home will be, they will also be able to advise you on what you need and maybe send you away with some of the food the dog has been used to eating, a blanket with familiar smells on, and maybe a favourite toy. 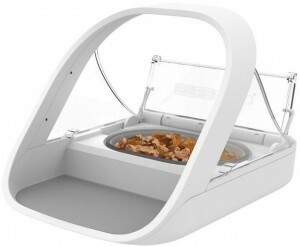 The aim is to minimise the animal’s stress by changing as little as possible as slowly as you can. If you want to feed your dog something different to what he or she has been used to, try to phase in the new food over a couple of weeks, else you may upset their internal system, especially in young pups. The number one recommendation for your puppy! It is easy to assemble, although I needed to use pliers to tighten the joints, else Betty was able to make a space big enough for her tiny body to squeeze out through. 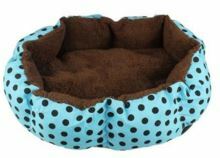 Go for a size that is large enough for your dog to move around in, as you can safely leave them in there whilst you go out for a short while, if you are worried about them harming themselves or anything else in the house. You can also use it later on for “time out” if they get overly excited and naughty. Putting them in the pen and ignoring them for a minute or so will teach them how you want them to behave, without scaring them by shouting. I can recommend the Easipet make. 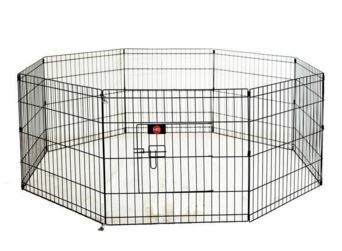 You can also get these playpens in fabric versions, which would be easier to pack up and travel with, perhaps, but maybe not as durable, depending on how destructive your breed of dog is. Your puppy is at risk of infectious diseases before all his or her vaccinations have kicked in. This could be weeks after you get them home, and you want to be able to start the socialisation process as soon as possible, by taking them outside and letting them experience new sights and sounds. The carry pouch is invaluable for this, as you can easily take your puppy on walks from as soon as they come home, without risking their health. I had Betty in the winter, so the carry pouch with a jumper on, was also a good way of keeping her warm. She was so tiny and quite frightened of things at first, so being carried close to my chest also made her happier to go outside and have positive experiences that built her confidence. 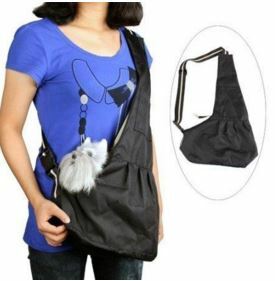 In the home, I still use the carry pouch for days at the computer when Betty wants to sit on my lap, as she has a tendency to fall off when she goes to sleep otherwise. This lasted a couple of months before Betty became a sleeping buddy in my bed. I would say that it is useful if you want your dog to sleep in a particular area of the house, and not invite themselves into your bed at night. You may have to get used to whimpering at first, or even barking. 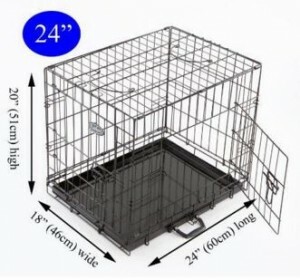 You could try having the cage in your bedroom, so your puppy knows you are there, or just brave out the period of him or her getting used to being away from you at night. Again, the size you get will depend on how big your dog or puppy is, and how much they will grow / how long you want to put them in a cage. They should learn where they need to sleep within a few nights without a cage, even if you have to keep returning them to their bed several times at first. 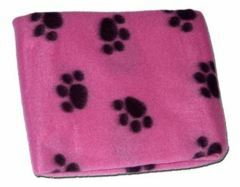 You may be lucky enough that the previous owner gives you a blanket that has familiar smells on it already, which will help ease your dog or puppy into their new home. Otherwise, it is a good idea to have a blanket as well as a bed because you can take the puppy wrapped in their blanket to do socialisation activities and they will be comforted and kept warm by it. Having their own things, such as a blanket and a bed, rather than sharing with, say, other animals or people in the house, will make them feel more secure. Again, this is another “must have” in my opinion. 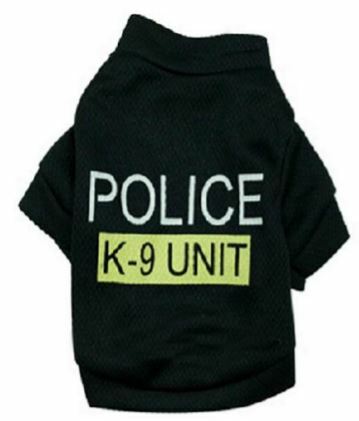 Remember that puppies need to be taken to the toilet outside every 3 hours during the night, plus any extra times they ask for, so it is easy to have a training bum bag that is ready to pick up on the way to the back door. The torch will help you see the mess to pick it up in the dark, so you don’t tread on it the next time you come out, and the Puppy Hearts treats are easy to break into tiny pieces, to reward a small puppy for going outside without upsetting their tummy by giving them too much of something quite rich. Just use your nail to break off a little piece of the treat at the time, or prepare several pieces in advance. I also recommend preparing the poop bags by opening them up and scrunching them back down again in the bum bag, as it can be frustrating to fight with opening one in the middle of the night, or at any other time. 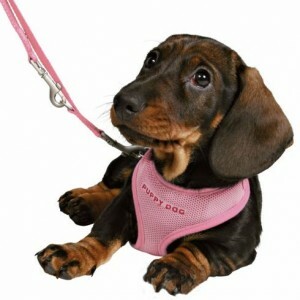 A harness is kinder on the puppy while he or she is learning to walk on a lead, so any pressure isn’t going directly onto a small area on the neck, but rather distributed across their breastplate. The long training lead can be used outdoors, but I used mine indoors, just trailing behind Betty, to slow her down a little when I was introducing her to my cats. You need to watch them at all times when they have the lead on though, in case they get caught up on anything. Puppies will want to do a lot of chewing because they will be teething. This variety pack has 3 types of bone. The Healthy Edible will be eaten slowly, but the Teething and Active Chewing bones are more durable. Once Betty got her adult teeth, she was able to start chewing bits from the Teething bone, but the Active Chewing bone has remained unscathed – perhaps it wasn’t as interesting for her to chew. 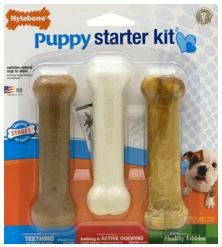 You can also put the bones in the freezer because the coolness will also help sooth your puppy’s gums. As part of your puppy’s socialisation and just continuing to lead a normal life, you’ll want to get him or her used to travelling in a car. If you don’t have a car, you can find ways to travel with puppies in bicycle baskets. Whatever your method of transport, other than walking, you need to make sure they are secure. Please don’t cycle with an adult dog trailing beside you on a lead – it’s illegal and could result in a nasty accident. Section 68 of the Highway Code says it is illegal to ride a bike in a “dangerous, careless or inconsiderate manner” and section 66 says that cyclists should not carry anything that will affect balance or get tangled in wheels or the chain. 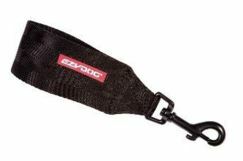 A dog lead – with dog on the end of it who could go off in a random direction at any time – fits with both these cases. Betty loves her food and used to gobble it so quickly out of a bowl that she gave herself hiccups. Someone recommended feeding her each meal in the appropriate sized Kong. When she was a young puppy, that was the Small Kong. She transitioned through to the Medium and now the Large Kong. You can easily refill a couple of times, if you have a big dog and want to feed him or her this way. 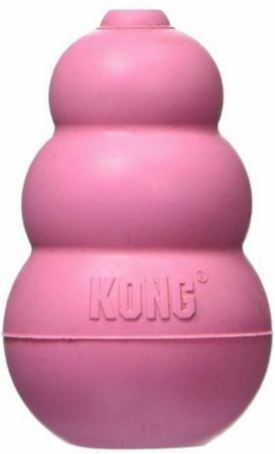 Usually, Kongs are used to administer treats and keep dogs occupied for some time if you manage to jam one nicely inside, but I tend to use Betty’s to slow her mealtimes down. Your puppy will have accidents and, even on the best carpet, it is not the end of the world. There are some excellent products that can get rid of stains and smells, so there is no need to feel angry towards your dog. They didn’t mean it, after all. Maybe you weren’t watching for signs they needed to go, or they need more attention. I tend to use Vanish carpet moose now that my animals are old enough to leave the patch alone. When Betty was tiny, I made sure I bought pet-safe products. 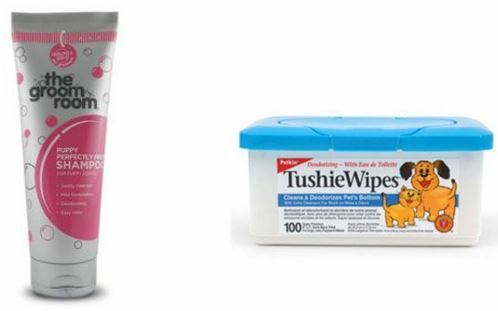 Puppy safe cleaning products may seem expensive if you compare to human alternatives, but they last a long time and are less likely to cause skin and face issues that may need an expensive trip to the vet. Betty is small, so we don’t use much shampoo each time. I think I am still on the same bottle of Puppilicious shampoo I bought when I first got her. I also fixed an extra long shower hose and got a bath mat for inside and outside the bath, so that it is easy to clean her up when we get in from walks. There are pros and cons to the material the bowls you choose are made from. Ceramic is easy to clean hygienically, as there are no cracks (hopefully) for germs to breed in. However, drop them and they shatter like glass. Plastic bowls are easier to handle and will bounce when dropped, but they can become scratched over time and harbour bugs. 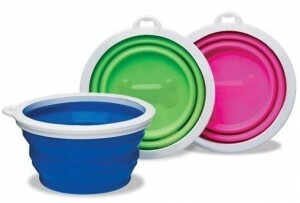 I use ceramic bowls at home and have a neoprene pop-up bowl to take on long walks. 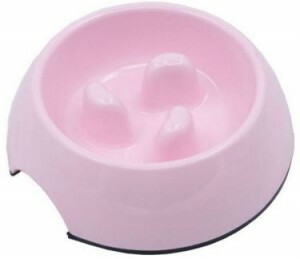 If you have a dog who gets hiccups from eating too fast, but you don’t fancy the Kong approach, there are special bowls with nooks and crannies to make them eat more slowly. Betty didn’t have much fur when I got her in the middle of winter, so she built up a little wardrobe of outfits to keep her warm and fashionable. There are some great clothes for dogs online and at specialist shops. Even the larger stores, such at Pets at Home, B&M and TKMaxx, have good outfits too – especially novelty ones for Halloween and Christmas. 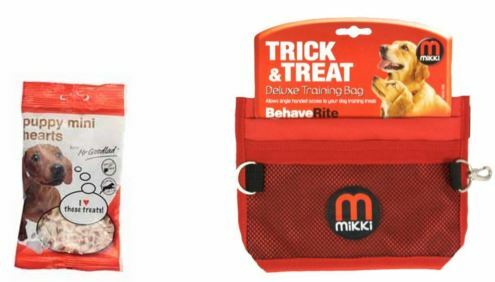 carry bag, play pen, puppy treats. Bookmark.